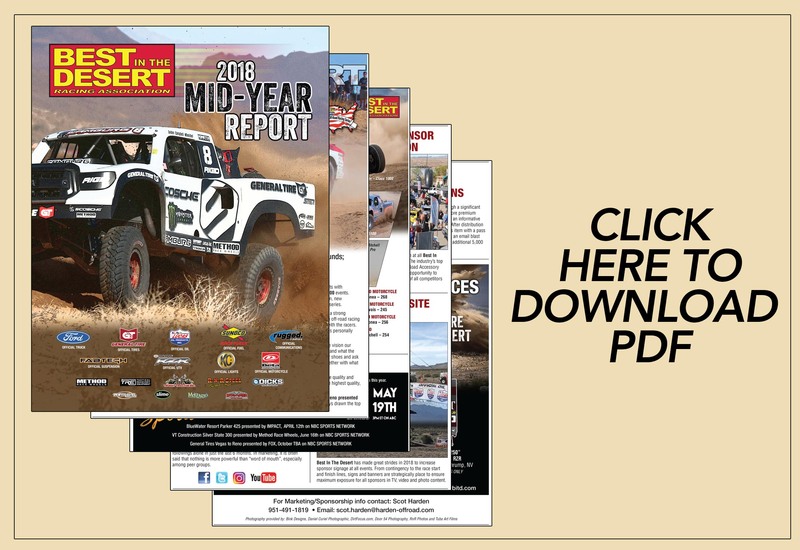 Through the first five rounds of 2018 “The American Off-Road Racing Series” has drawn a record number of participants with over 1,300 entrants participating in the Parker 250, Parker 425, Mint 400, UTV World Championship and Silver State 300 events. Participation in all classes is up with significant growth across all classes and in the UTV segment in particular. 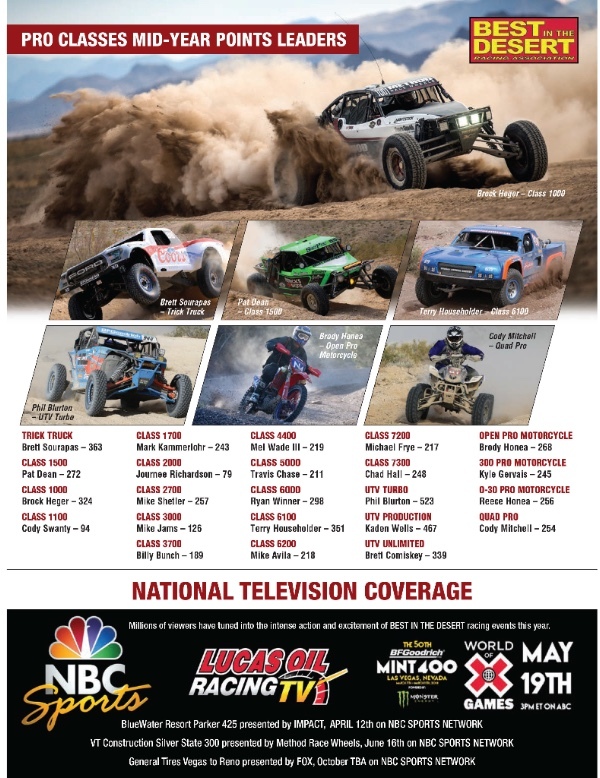 In addition, new sponsors, increased media coverage and a renewed investment in marketing have all led to a much higher profile for the series. 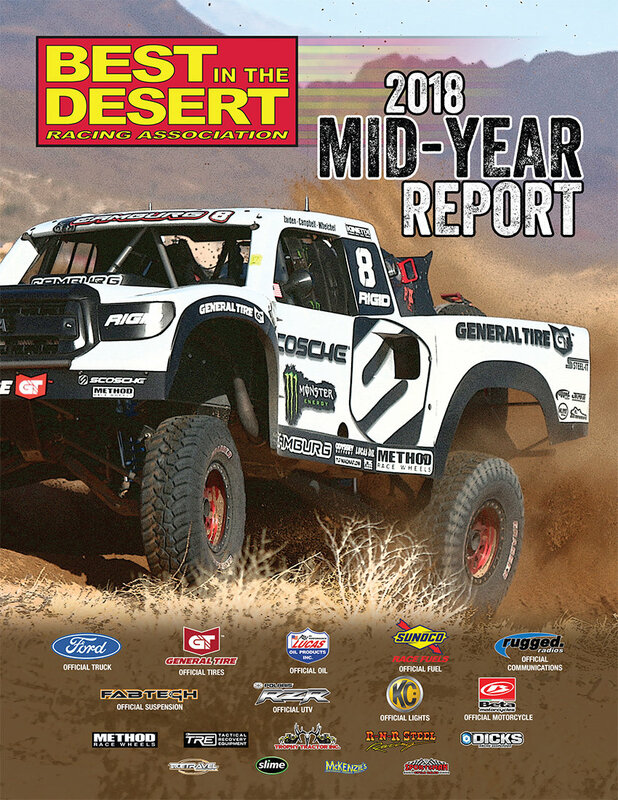 “There is no doubt we are off to a great start in 2018”, commented Best In The Desert Co-Owner Daryl Folks. 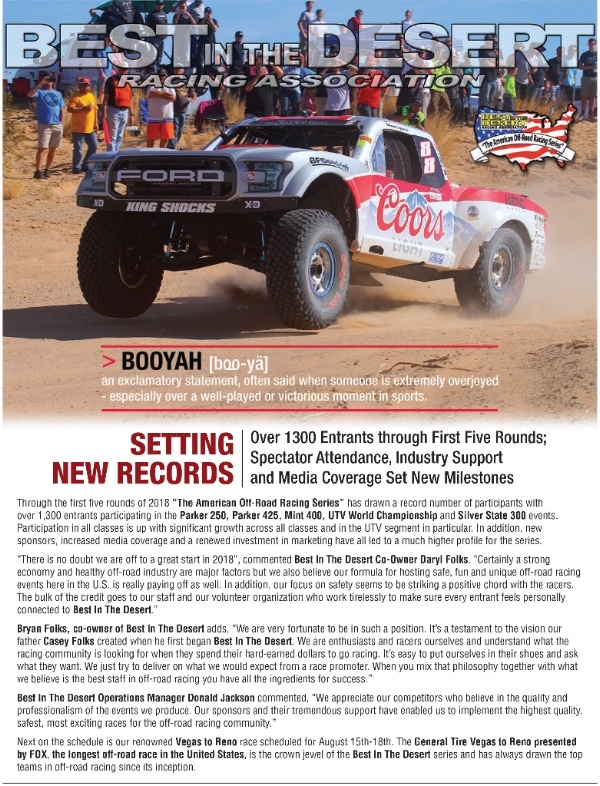 “Certainly a strong economy and healthy off-road industry are major factors but we also believe our formula for hosting safe, fun and unique off-road racing events here in the U.S. is really paying off as well. In addition, our focus on safety seems to be striking a positive chord with the racers. The bulk of the credit goes to our staff and our volunteer organization who work tirelessly to make sure every entrant feels personally connected to Best In The Desert. 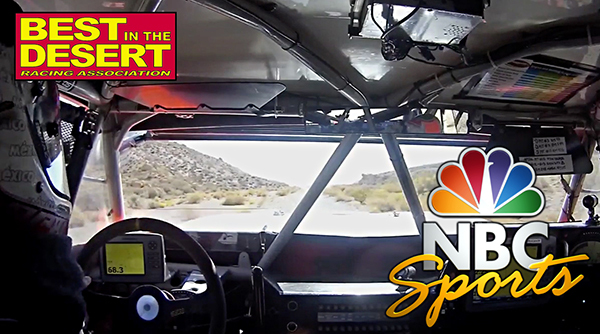 Next on the schedule is our renowned Vegas to Reno race scheduled for August 15th-18th. 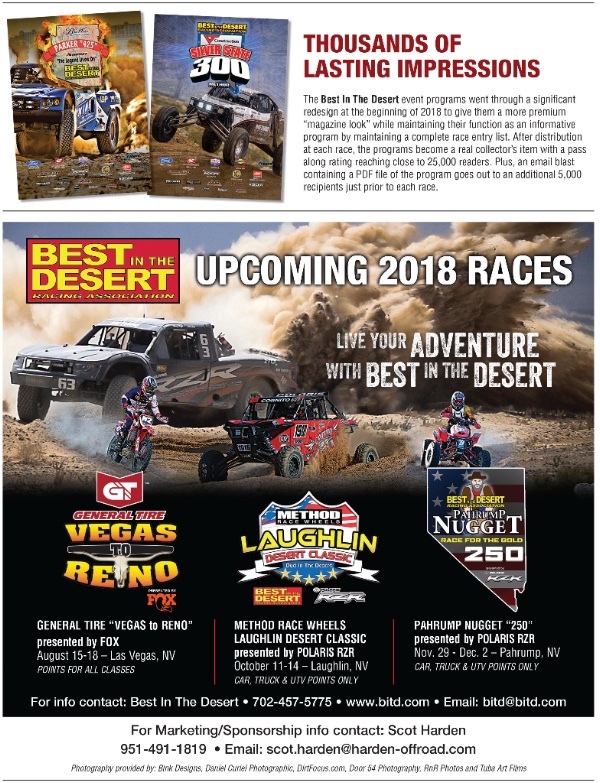 The General Tire Vegas to Reno presented by FOX, the longest off-road race in the United States, is the crown jewel of the Best In The Desert series and has always drawn the top teams in off-road racing since its inception. 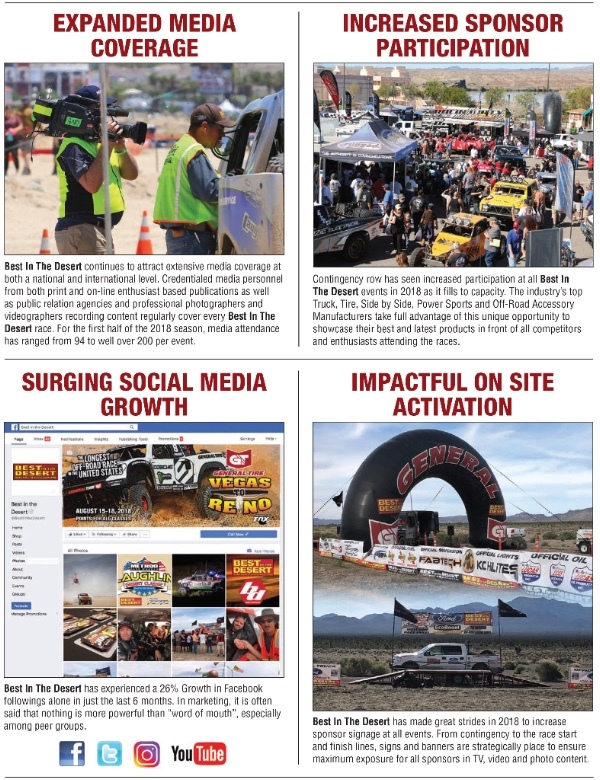 Highlights of the Report include Current Points Standings, National Television Coverage, Expanded Media Coverage, Increased Sponsor Participation, Surging Social Media Growth, Impactful On Site Activation and Thousands of Lasting Impressions from Best in the Desert Publications. Bink Designs, Daniel Curiel Photographic, DirtFocus.com, Door 54 Photography, RnR Photos and Tuba Art Films.